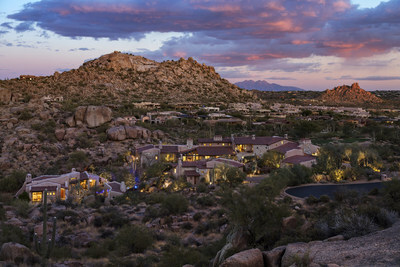 NEW YORK, Dec. 13, 2018 /PRNewswire/ -- Concierge Auctions has announced the extension of the auction date for former Magellan Fund Manager Peter Lynch's 14,231-square-foot Scottsdale, AZ family compound. The property will now be inclusive in the January Sale in Arizona featuring a collection of top-tier properties. Bidding will open digitally via the Concierge Auctions online marketplace, conciergeauctions.com, which allows prospective buyers to participate in real-time from anywhere in the world. The sale will culminate at a live auction at The Phoenician, one of Scottsdale's most luxurious resorts, on January 31st. The property will sell inclusive of furnishings valued over $2 million, and the winning bidder will have the exclusive right to purchase the three adjacent home sites in addition to the three lots on which the property is situated. Currently listed for $9.5 million, the estate will sell Without Reserve in cooperation with Julie Rohr of Walt Danley Realty. Set on more than three and a half acres, 27341 North 102nd Street — designed by Jeff Biever Architecture and Mariette Gomez Design Group — offers a traditional adobe exterior with contemporary interiors featuring a light-filled, open floor plan with multiple floor-to-ceiling fireplaces, soaring ceilings, skylights and walls of windows. In addition, stone and hardwood floors line the main home, and custom niches provide elegant spaces for displaying art and sculpture. Featuring eight bedrooms, the estate also offers a very spacious chef's kitchen with custom cabinetry, walk-in pantry, large island, and multiple ovens; a master sanctuary with a private balcony, enormous spa bath, fireplace, and clerestory windows; a downstairs fireside lounge, an elevator, three-car garage, wet bar, library, and game room. Outdoor amenities include a swimming pool with waterfall and underground waterslide, pool house, multiple covered and open terraces, a cooking ramada, areas for outdoor entertaining, an expansive patio space and a private guest house. The property and surrounding areas also feature large, dramatic rock outcroppings and natural beauty that are unique to the area, as well as 20 different types of cacti, succulents and trees, including chollas, ocotillo, saguaro, and prickly pear, that provide for a Southwest, Sonoran Desert landscape. 360-degree views of mountains, peaks and boulders, abound as close as 100 to 500 feet away up to 10 to 20 miles away. The multi-structure, Southwestern oasis is located within the guard-gated community of Estancia, where Residents have access to the private member-owned Estancia Club, one of the most unique and scenic communities in Arizona — equipped with a fitness center, spa, and swimming pool, and offering outdoor and social activities — and its famed Tom Fazio-designed championship golf course. Residents also have easy access to fine dining, shopping, cultural offerings, and sporting events in Scottsdale. In addition to sightseeing and hiking at Scottsdale's Pinnacle Peak and Camelback Mountain, there are multiple outstanding bike trails at Tom's Thumb and numerous other natural parks. For more information on this property, and to view all properties for sale by Concierge Auctions, visit www.conciergeauctions.com or call +1.212.202.2940. Concierge Auctions offers commissions to listing and buying real estate agents. See Auction Terms and Conditions for full details.